Click here for Site Index on home page or scroll down. Click on a CD title to go to the order page where you will find full instruction on how to order. Jade CDs are widely heard on national and fine music stations throughout Australia, and are recognised as a valuable resource by educational authorities as being uniquely representative of the work of Australian composers. They are manufactured in limited runs of 500 and stocks are therefore limited. Many of the distinctive Jade CD covers display stylish black & white photography by Nicolas van der Waarden. To buy a CD click on the title and you will go straight to the Shopping Cart. Acquisition officers for Australian/New Zealand libraries and educational institutions may order from Check List. For biographical information on other Australian composers whose works are featured on Jade CDs, please visit the Australian Music Centre. This CD presents a selection of works by Australian composers which is remarkably homogenous considering that the dates of composition range from 1927 to 2004. Though not all compositions were written under nocturnal influences, many of them maintain the crepuscular mood set by the title piece, Allworth's “Dangerous Moonlight” for solo piano, performed with conspiratorial understanding by Ray Lemond, who maintains melodic mysteries within the work's evocative harmonies. Lemond's own piece, “Midnight” takes pianism into the further reaches of the unfathomable. There is even an Allworth piece for mandolins titled “Twilight”, performed by the Sydney Mandolins who also give a sympathetic reading of “Epilogue for Stephen” Op.274 (2004) by Gross, who has written many fine pieces for this ensemble. Here he applies modernistic subtleties to this elegy on the premature passing of a young postgraduate scientist, who also maintained a love of music. Differing music styles for solo piano retain a reflective mood in Allworth's “Minnesota Dreaming”, Agnew's “An Autumn Morning” Gross's “Rondino Tranquillo” and Carr-Boyd's “A Day In Taralga”. Three pieces provide contrasting vigour. “Klavierstuck II Op.127” by Gross is a work for solo piano of sustained invention of around 8 minutes' duration. Its material stems from “different thematic and rhythmic cells so as to provide an overall improvisatory effect”. Virtuoso pianist Simon Docking achieves an idiomatic and idiosyncratic performance. The CD closes with two short instrument duos written by Strahan in 1963, heard here in Midi Realisations. “Population Pressure” for Flute/Piccolo and guitar provides a musical metaphor for a “birth clock” whose relentless digital count “numbers each addition to our planet's population. “Trespassers Will Be Prosecuted” for clarinet and piano, is an exercise in perpetual motion, suggested by the surf at Bondi Beach – the title being the legend on a battered sign posted outside the crumbling apartment block where he then lived. 9. ERIC GROSS - "EPILOGUE FOR STEPHEN" 0p.274 (2004) 5'28". The Sydney Mandolins: Personnel as Track 2. 10. DEREK STRAHAN - "POPULATlON PRESSURE" for Flute/Piccolo & Guitar (1963) 2'37". Works by: Giovanni Palestrina, Robert Allworth, Geoffrey Allen, Eric Gross, Derek Strahan , Carson P. Cooman. The CD opens with three organ works written and played by Carson P. Cooman on the organ of the Rochester Christian Reformed Church, Penfield , New York , USA . “Gallery Music: A Processional Fanfare” (2000), is imagined as a procession taking place within a huge “Gallery”, and is dedicated to Jane t & Arthur Perrin. “Twilight Undulation” (2001) is based on the plainsong Ad dominum dum tribularer clamavi, and written in memory of American composer Robert Starer. “Sunburst: A Recessional Fanfare” (2001) is dedicated to Robert Allworth. An effective musical montage follows alternating works by Palestrina and Allworth, as listed below, and performed respectively by Carson P. Cooman at the organ of the Memorial Church , Harvard University , Cambridge , Massachusetts , USA , and by the Choir of Christ Church St. Lawrence, Sydney, conducted by Colin Sapsford. Secular works follow. “Serenatella” (1995) by Allen is a romantic piano piece dedicated to his wife. “Rondino Pastorale” (1962) and “Miniature for Ray” (1994) by Gross both feature the Sydney Mandolins. Strahan's “Ironical Rondo” for piano, was begun in 1953 when the composer was at school in Belfast , Northern Ireland , then laid aside to obey dictates to study languages for Cambridge Entrance, and finally revised and completed in 2003. It reflects Strahan's interest then, as now, in using elements of jazz in a formal classical structure. In its final form it includes, as a contrasting episode, a short lyric piece written in London in 1958, titled “Birgitta”, after an attractive brunette. The CD closes with the title track written by Gross in 1972 as a Wedding March, and a religious devotion for organ by Allworth. 3. CARSON P. COOMAN – sunburst; a recessional fanfare (2001) Carson P. Cooman - organ, Rochester Christian Reformed Church, Penfield , New York , USA . 12. GOSPEL PROCESSION – arranged from Saint-Saens Symphony No. 3 by Colin Sapsford. Colin Sapsford, Organ, Christ Church St. Lawrence , Sydney. Five works for solo piano open this CD, beginning with the title track by Allworth and played by David Miller. Composed in 1987 and based on a 12-tone row, it employs chordal, contrapuntal and rhythmic devices to portray the ever-changing moods of the ocean. Shanahan's “153 Infinities” (1996), is played by Zubin Kanga. In his own words Shanahan “eschews mundane pulse and its obsession with piano-resonance and colours” to create “an ecstatic detachment from Time's unyielding flow”. Strahan's “Patriarchy” (1992) is extracted from his longer “Atlantis variations” and arises from the following pathology: “Law-maker, law-breaker, moral angst, phallic imperative, existential rage, scientific curiosity, religious fervour”. Sally Mays is then heard playing Allworth's “Reflections At Nightfall” (2002) and Gross's “Sallymede” (2002), is dedicated to the performer, and depicts aspects of the English countryside near where she now lives. Further solo piano works by Carr-Boyd,“Saturn” (1978), and Betty Beath, “Contrasts (1983), are also heard, played respectively by the composers. Gross also contributes a suite of four mandolin duets titled “Paul and Adrian” (1989), after two brothers in the Hooper family who form the basis of a Plectrum ensemble “The Sydney Mandolins”. The work makes full use of many different techniques employed by mandolinists. TRACKS 11 – 15 .Carson P. Cooman - organ, Memorial Church Harvard University Cambridge Massachusetts, USA. Works by: Geoffrey Allen, Robert Allworth, Eric Gross, Derek Strahan. Duration: 60'17"
"After The Rapture", Allen's 20-minute Suite for piano solo (2001) offers four contrasting movements written in reflective and elegant style, and which were composed while Allen (a publisher) was engaged in preparing a complete edition of the works of Australian composer Roy Agnew. The work is dedicated to Agnew's sister, Marjorie. Five movements follow from Allen's extensive work "Diversions" (1994) for oboe, clarinet & bassoon further reveal the composer's gift for melody and aptitude for counterpoint. Three works for solo piano complete the CD. Allworth's "Autumn Reverie", played by David Miller, comprises five preludes in elegiac mood: Mosaics - Yellow - Gold - Grey - Green. "Pensive Prelude", composed & played by Gross, is a gentle, evocative piece requiring thoughtful use of the sustaining pedal. In contrast, Strahan's "Atlantis Variations, Part 3" employs the resources of the piano to depict an asteroid strike on the Earth in 8,500 BC which terminated the Quaternary Age, brought on the Great Flood, and may have caused the sinking of Atlantis. This is one of several works developing material for a proposed 4-opera cycle on Atlantis. Works by: Tomas Luis de Victoria, Robert Allworth, Carson P. Cooman, Lawrence Bartlett, Derek Strahan, Ann Carr-Boyd. Eric Gross, Duration: 64'09"
This CD displays a characteristic feature of Jade releases - a combination of sacred and secular music. The colourful cover illustration of St. George slaying a dragon, illustrates the opening 4'30" track by Allworth: "Prelude for the Most Holy Name of Jesus & Saint George & The Dragon" (1990) which is followed by Allworth's 6 Meditations of Early English Saints (1990). Both works are for organ and are given a vivid interpretation by US organist and composer, Carson P. Cooman, on the organ of the Harvard University Memorial Church. Two contrasting works by Cooman follow, "Tenebrae Canticle"(2001), exploring ideas of liturgical darkness, and the sprightly "Dawning", a birthday portrait for a friend. Two historical recordings made in 1979 at Sydney's Christ Church St. Lawrence capture the ambience of this location as Colin Sapsford directs the choir in settings by Tomas Luis de Victoria (1548-1611) of "Missa O Magnum Mysterium" and a Good Friday Hymn. Bartlett's own "Ceremonial Te Deum" (1988) is heard, as sung by choir and organ at a special service of Morning Prayer, at St, Andrews Cathedral, Sydney, in the presence of the Prince and the late Princess of Wales, during the 1988 Bicentennial celebrations. In secular mode, Gross contributes two works: "Rondino Pastorale" for flute and Plectrum Ensemble (1962), and Prefatory Sonnet (1984) one of 3 Songs for soprano or tenor, clarinet & piano, in this instance sung by Anthony Walker. Strahan's Atlantis Variations for Solo Piano, Pt. 2, (1992) is one of several works developing material for a proposed 4-opera cycle on Atlantis, this one centred around the character of Calypso, a rebellious daughter of Atlas. The CD closes with Carr-Boyd attractive miniature for piano, "Maladies Of love" (1982). One of the aims of the Jade label is to preserve Australian musical history by re-mastering and releasing significant recordings. The centrepiece of this release is a live recording made in Christ Church St. Lawrence, Sydney, at the Liturgy on Good Friday in 1979, sung to traditional plainchant with choruses by Tomas Luis de Victoria (1549-1611) by Charles Dale, Donald Haws and Brian Copeland with the Church choir conducted by Colin Sapsford. This is preceded by Allworth's "Times Remembered" for 3 oboes and two organ works by Eric Gross. The religious theme is also present in solo piano and organ works by Allworth, and No. 4 of Austin's Meditations (for piano) on the Ten Commandments. Secular music is represented by Allworth's 3 piano solos titled after well-known TV soap operas, Carr-Boyd's jazzy piano piece "Carl's Motel Music", and 3 of Strahan's satirical songs for voice and guitar written for a Breakfast Show TV spot, and performed by the composer. Works by: Carson P. Cooman, Robert Allworth, Eric Gross, Steve Clark, Ann Carr-Boyd, Betty Beath, Ian Shanahan, Derek Strahan. Duration: 66'16"
This is the third Jade CD featuring compositions by American composer and organist Carson P. Cooman along with works by Australian composers. The CD is dedicated to all people of New York and the USA who suffered on September 11 2001. The sound quality on this CD is exceptional. It opens with Allworth's 2001 work "Organ Preludes for Saint and Martyrs", a suite of 6 short pieces each being a portrait in music of a canonised historical figure. These are ably played by Cooman on the organ of the Memorial Church, Harvard University, Cambridge, Massachusetts. On the same instrument Cooman plays his attractive meditation titled "Jesus Is The Sunlight" based on the hymn tune "Callahan" by American composer Alfred V Fedak. Beath's "Mikri Thalassa (Little Sea")" was commissioned in 1993 by Adrian Hooper for the Sydney Mandolins. Its attractive sonorities were inspired by the spectacle of fisherman gathering sponges from the sea near the island of Kalymnos in the Dodecanese. Also composed for Hooper's Mandolin ensemble in 1985 is Eric Gross's very fine "Suite No. 1 for Plectrum Orchestra or Quintet" in four contrasting movements. Shanahan's capacity for original invention in his own unique avant garde style is illustrated by two works: his contemplation on the Cosmos, "Zodiac: Crystal Orbit Improvisations"(1996), a mandalikon for amplified soprano recorder, MIDI wind instrument, and keyboard synthesizer; and the recent "Harmonia (in PP)" for tenor recorder and piano, written in memory of Professor Peter Platt. Steve Clark's "Phryg Magnet"(2001) for violin and piano is an appealing piece in the Phrygian musical mode. Strahan himself is heard as singer, guitarist and harmonica player in four of his own "Songs of Peace, Love and Apprehension" chosen from material written and recorded during 1970/74, when he appeared in a weekly TV spot on the Channel 7 Breakfast Show and also at folk-song venues. The CD concludes with Carr-Body's short orchestral piece "Images of Australia"(1985) as performed by the Adelaide Symphony Orchestra. Strahan's four songs are also released on his new CD "Take Me To Your Leader", on the Revolve label, Revolve RDS004. Read liner notes for "Take Me To Your Leader". Audio files of these songs listed below. Listen to "Mountain and Rain"
Listen to "It's All Happened Before"
Works by: Carson P. Cooman, Robert Allworth, Eric Gross, Ian Shanahan, Derek Strahan , Eric Gross. Duration: 76'06"
This is the second Jade CD featuring works by both American and Australian composers. Prolific US composer Carson P. Cooman, also a fine organist, again performs music by Allworth, his "Suite for organ (2001), Visions of Saint Catherine Laboure, St. Michael the Archangel", commissioned by the Roman Catholic Parish of St. Michael, Callas, New York, USA. Cooman plays three of his own organ works, "Gallery Music: A Processional Fanfare" (2000), "Twilight Undulations" & "Sunburst: A Recessional Fanfare" (2001). These works were all recorded in the USA, featuring the magnificent sonorities of the Organ of the Rochester Christian Reformed Church, Penfield, New York. Allworth also contributes three impressionist solo piano pieces written using serial techniques, depicting favourite harbourside locations in Sydney, Australia; and his impressive 13'00" "Cardboard Cantata" (2000) , written for mandolin ensemble with piano, after the title of a book by Prince Lorenzo Montesini. The CD is named after Shanahan's "Lines of Light: Seven Improvisation on aitheros melos (Music of the Spheres)" (1991/1993), a work for amplified recorders, Yamaha DX7 keyboard synthesizers and percussion, performed respectively by the composer, Roger Dean and Daryl Pratt. In this strikingly original 11'10" work, Shanahan invokes the notion of solar spectra. Roger Dean also performs Shanahan's short and related solo piano piece, "Arc Of Light". Strahan's "The Beethoven Boogie" (1982), a 9'00" joke for 8-piece jazz ensemble, including cello, satirizes the 80's "switched-on classics" pop fad, by adapting its style to an entire movement in strict sonata form. This piece is the last movement of Strahan's Jazz Fusion Suite, of which the first movement ,"Triple Six", was released on Jade CD "Fray" JADCD 1086, and the second movement, "Free Spirit", on Jade CD "Music For A Candlelight Dinner" JADCD 1058. In a similar spirit of whimsy, is Gross's lively "Sally in the Mallee" a short solo piece written for pianist Sally Mays, who requested something "a little bit crazy". Works by: Robert Allworth, Ann Carr-Boyd, Carson P. Cooman, Eric Gross, Ian Shanahan, Laurence Bartlett, Derek Strahan, Betty Beath, Mary Mageau. Duration: 69'01"
This is the first Jade CD featuring works by both American and Australian composers. Prolific US composer Carson P. Cooman, also a fine organist, performs two pieces written by Allworth in 2000 and dedicated to the memory of Oscar Wilde (A Dream of Decadence / Decay of Lying) as well as his own "Romanza For Organ" (2000), a meditative piece enriched by lush sonorities. The works were recorded in the USA and played on the Isham Memorial Organ (built 1967) in The Memorial Church, Harvard University. The title track, by Carr-Boyd (for flute & piano) was inspired by the composer's attendance in 1992 at a meeting at a large theatre in Hartford, Connecticut, held to commemorate Martin Luther King Day. Also for flute & piano is Strahan's "Et In Arcadia Ego" (1990), a Cantata from a larger work "Atlantis" (released on JADCD 1063, "Voodoo Fire"). This segment portrays a lovers' idyll on the balcony of a villa overlooking the ocean on a moonlit night in Atlantis. Exciting counterpoint abounds in "Essay for Mandolin & Wind Quintet" (1996) by Gross and in his intriguing "Concertino for Button Accordion (Bayan) and Plectrum Ensemble" (2000). Allworth's "Study In Grey" for Mandolin and Wind Quintet (1997), a serial work, sustains lyricism through the use of surprising harmonies and melodic lines. Shanahan's "Solar Dust: Orbits & Spirals", a work for solo mandolin, employs a range of devices (including microtonal deviations) to paint a "spacescape" of the planet Saturn, observed through the ice crystals which comprise its rings. Mageau solos in her own piano work "Soliloquy" written in 1984 as a dance piece , and Barnaby Ralph ably conveys elemental quietude in Beath's Night Songs No. 1 & 2, for solo Recorder, Bass then Alto. In Bartlett's celebratory "Procession for Elizabeth" the composer provides organ sonorities recorded in Sydney, Australia. Carson P. Cooman has given live performances of a number of Allworth's organ works in the US, which have received favourable notices in the press. Click here to read these. Read an Australian review by Rita Cruise in The Studio, quarterly magazine of the Music Teachers' Association of New South Wales. Listen to "Et In Arcadia Ego"
Works by: Dulcie Holland, Robert Allworth, Ann Carr-Boyd, Eric Gross, Ian Shanahan, Lawrence Bartlett, Colin Brumby, Derek Strahan. Duration: 51'31"
Read press review about "Dulcie Holland & Friends"
Works by: Robert Allworth, Lawrence Bartlett, Ann Carr-Boyd, Eric Gross, Dulcie Holland, Ian Shanahan, Derek Strahan. Duration: 66'37"
A collection of contrasts. Shanahan's "Echoes.Fantasies"(1984) for bass clarinet and percussion (vibraphone and bells) exploits extremes of tempo, beginning and ending in a lively and ecstatic manner. The slow and shimmering middle section evokes images of remote parts of Australia. Soloists are Nigel Westlake and Michael Askill. Shanahan also contributes an early synthesizer piece "SineBirds:FeralAbacus" and his own performance of "Five Etudes" for solo recorder. Allworth's "Movements For Mandolin & Piano" (1999) celebrates the Feast Day of the Assumption of the Blessed Virgin Mary. Carr-Boyd's ever popular "Fandango" is heard here in a new arrangement made for The Sydney Mandolins. Tenor David Hamilton, with composer Nigel Butterly on piano perform Holland's "Three Tree Songs" (1991) set to poems by Andrew Lansdown, and her "Ballad for Clarinet & Piano (1952) is heard in a remastered vintage recording featuring Clive Amadio and Olga Krasnik. "Suite For Trombone Quartet (1997) by Gross exploits the full resources of the instrument. Bartlett's "Jolly Octopus" recalls a "show and tell" scene at an Infants' School. The CD concludes with Strahan's 15-minute "China Spring" (1989) for Cello & Piano, written to commemorate the "Tiananmen Square Massacre" of 4 June 1989, heard here in an incendiary premier performance given at the Sydney Conservatorium of Music by Georg Pedersen, cello and David Miller, piano. Works by: Kirsty Beilharz, Eric Gross, Dulcie Holland, Caroline Szeto, Robert Allworth, Ian Shanahan, Ann Carr-Boyd, Lawrence Bartlett, Derek Strahan. 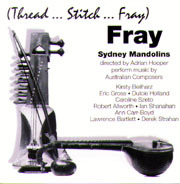 Duration: 51'01"
"Fray" is probably one of Jade's most varied ever collections, starting with the title track for mandolins by Beilharz, "a musical implosion" written for the 1997 Australian Women's Music Festival and performed here by the Sydney Mandolins. More for mandolin ensemble by Szeto, Carr-Boyd, mandolin solo by Gross, expert recorder solos composed & performed by Shanahan, piano music by Allworth and Holland, Bartlett's elegiac piece for trumpet and piano, and Strahan's Jazz Fusion work for 8-piece ensemble, "Triple Six" an evocation of the biblical Apocalypse. Works by: Robert Allworth, Vernon Lisle, Colin Brumby, Betty Beath, Ann Carr-Boyd, Eric Gross, Derek Strahan, Ian Shanahan. 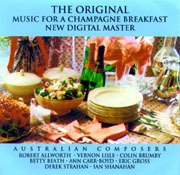 Duration: 72'50"
A re-release of the original "Music For A Champagne Breakfast" which was so popular it sold out! Features the late Vernon Lisle's two "Schubertian" piano sonatas, Brumby's Italianate "Borromeo Suite" for flute & guitar, Beath's sun-drenched Mikri Thalassa (Little Sea) for mandolins & guitar, Strahan's jazzy "Escorts" for flute, alto saxophone & piano, plus short atmospheric pieces by Shanahan (solo clarinet), Allworth (solo piano), Gross and Carr-Boyd. Works by: Eric Gross, Colin Brumby, Derek Strahan, Ann Carr-Boyd, Dulcie Holland, Robert Allworth, Lawrence Bartlett, Richard Austin. Duration: 71'06"
"Sanctus" opens with 6 Organ Voluntaries composed in 1972 by Allworth, ranging in mood from the contemplative to the celebratory, in honour of Saint Catherine Laboure who was visited by the Virgin Mary in a vision in 1830. These and a short occasional piece by Brumby are performed by Lawrence Bartlett at the organ of St. Michael's, Vaucluse. Bartlett's own 'Ceremonial Te Deum' is performed by organist Bransby Byrne and the choir of St. Andrews Cathedral - a live recording made in 1988 at a special Bicentennial service in the presence of Prince Charles and Princess Diana! Secular music is represented by solo piano works by Carr-Boyd ('Saturn' 1978) and Austin (Impromptu No. 4, 1998); by two lyrical works of Dulcie Holland, for String Quartet and for Mandolins; by the virtuosic 'Triptych for solo violin' (1991) by Gross, and by a recent live recording by Georg Pedersen of Strahan's 'Suite No. 1 for Solo Cello', a Suite of Jazz Dances. Made at a concert by the Ku-Ring-Gai Virtuosi, this performance was well reviewed by John Carmody in the Sun Herald, who wrote: "... Like the baroque (cello) suites, this is made up of dance movements and there is real wit in hearing boogie-woogie, a tango and blues coming from a solo cello. The composer never laboured the jokes and Georg Pedersen handled it with aplomb. I almost expected him to waltz off, partnered by his curvaceous cello ..." Music critic Fred Blanks, writing in the North Shore Times in January 1999, listed this performance as one of "the eight most striking performances of Australian music which came my way in 1998." Read about "Suite No.1 for solo cello"
Works by: Robert Allworth, Laurence Bartlett, Dulcie Holland, Eric Gross, Colin Brumby, Ann Carr-Boyd, Derek Strahan, Betty Beath. Duration: 67'48" Laurence Bartlett performs organ works including two of his own: the title track and "Lament For Duncan", inspired by Shakespeare's "Macbeth". Four preludes on religious themes by Allworth using serial technique contrast with two tonal works by Holland and Brumby. Gross contributes two occasional pieces of substance. Strahan's "Wedding March" is the first music written for a proposed new opera, "Takeover", on the subject of a stock market crash! Vocal music is provided by Beath's orchestration of five of her "River Songs" performed by soprano Jan Delpratt with the Queensland Symphony, conducted by Richard Mills. Beath solos in Allworth's intense 1966 Piano Sonata. In lighter vein Carr-Boyd is pianist on two solo pieces, plus the duo "Slow Jazz" in which she is joined on violin by her daughter, Katrina Carr-Boyd. Works by: Eric Gross, Dulcie Holland, Robert Allworth, Derek Strahan, Soon Yeon Choi. Duration: 55'46. "Fandango" is one of four works by Anne Carr-Boyd on a CD which also features compositions by her student Soo Teon Choi ("Flamenco Fantasy"). 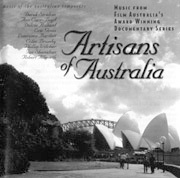 Gross, Holland and Allworth provide works in a variety of styles for the Sydney Mandolins, and the CD concludes with Suites 3 & 4 of film music by Strahan titled "The Australian Ark", written for Robert Raymond's documentary series on Australian wild life, shown widely on TV here and abroad as "Shell's Australia". Suite 3 "The Coming Of Man" is based on musical scales used by peoples of Arnhem Land. Suite 4, "Land Of Birds" for a trio of flute, clarinet & cello is performed by Neville Amadio, Donald Westlake and Robert Miller, then of the Sydney Symphony Orchestra. Works by: Dulcie Holland, Eric Gross, Robert Allworth, Derek Strahan. Duration: 59'41. Meditative works of melodic charm make up the first half of this CD. The title piece is named after Sir Robert Menzies' autobiography and was composed by Allworth in 1991 for the Sydney Mandolins who also contributes "Lady In Blue" ("Immaculate Heart of Mary") for String Quartet. Two more string quartet pieces are by Dulcie Holland and were written for children of members of the Gagliano Quartet, who perform them. Holland's evocative "Barely Spring" for flute, violin & cello follows with "Rondo Tranquillo" by Eric Gross for solo piano. Change to an up-tempo mood is provided by Suites Nos. 1 & 2 of "The Australian Ark", music composed by Derek Strahan for a major 13-part film documentary series on Australian wild life made by distinguished author/film producer Robert Raymond and originally screened on TV in the 70s as "Shell's Australia" . Works by: Dulcie Holland, Ann Carr-Boyd, Colin Brumby, Eric Gross, Lawrence Bartlett, Robert Allworth, Derek Strahan. Duration: 61'30" This is a follow-up to the popular Volume 1 (now sold out!). Clarinettist Paul Champion with pianist Tony Baldwin perform works by Gross ("Happy Clarinet" , "Three Inventions"), Carr-Boyd ("On The Shores of Aswan") and Bartlett ("Bosun Club"). Holland contributes a Suite for solo oboe, "Three Signatures" (1992), "Rondel" (1985) for cello & piano and "Self Portrait" (1992) for solo clarinet. Allworth's "The Ascension" (1993) is a highly original work for Recorder Consort. Strahan's "Trans Australia Suite No. 2" (1968) presents more music from "Wheels Across Australia", a film documentary about the Leyland Brothers' transit of Australia by 4-wheel drive. Works by: Derek Strahan, Eric Gross, Colin Brumby, Dulcie Holland, Robert Allworth. Duration: 63.25 Title work is a 25 min. Scena for Soprano, Flute/Alto Flute & Piano , music & libretto by Strahan, which develops material intended for the first of a cycle of four operas on the subject of past civilisations lost to global cataclysm. The libretto (which is included in liner notes) describes Eve's recollections of a lovers' tryst and also denotes an earth which is geologically different. It is performed by Liza Rintel, Michael Scott and David Miller. Other major works are Holland's eloquent 1993 Cello Sonata, and Allworth's impressive 1988 Concerto for French Baroque Lute & Chamber Ensemble. Two short works provided further contrast: an organ choral by Brumby and "Thanksgiving", a piano solo by Gross, celebrating the 40th wedding anniversary of relatives living in Pittsburgh, Pennsylvania. Read about "Eden In Atlantis"
JADCD 1073 Works by: Derek Strahan, Ann Carr-Boyd, Colin Brumby, Robert Allworth, Eric Gross, Dulcie Holland, Ian Shanahan. Duration: 71.00 This CD contains two 15 minute Suites of film music by Strahan: "Cult of Diana" (1992) and "Fantasy" (1990) both scored for virtual orchestra (synthesizer) with live flute (Michael Scott) and saxophone (Graeme Lyall) in "Cult". Four fine elegaic solo piano works are featured. 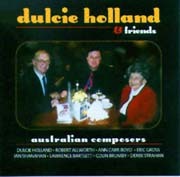 Two are performed by Dulcie Holland, her own "Four Aspects" and the title track by Allworth; Brumby gives his own "Twilight Pastoral" and Simon Docking contributes Shanahan's highly individual "Arc Of Light" (1993). Imaginative scoring for organ and strings distinguishes Carr-Boyd's "Music For A Space Journey" (1974). Gross and Allworth provide contrasting piano & mandolin pieces. The CD is named after Strahan's 16 minute work premiered in April, 1996 at the Canberra School of Music by Alan Vivian, clarinet; Michael Askill, percussion & Susan Powell, piano & synthesiser. The work evokes Caribbean rhythms and Voodoo ceremonies. Following is Strahan's "Atlantis" for Flute & Piano, as performed in 1992 at a Masters Degree Recital at the Sydney Conservatorium of Music by Belinda Gough and Josephine Allan. The work develops themes intended for a 4-opera cycle. "Mandigar 3" by Gross is the first of 4 works for mandolin, ensemble or solo. The CD closes with a fine piece on a religious theme for Organ by Allworth, "Hymn To The Bleeding Host of Santarem, Portugal" (1989). Read more about "Voodoo Fire"
Works by: Derek Strahan, Ann Carr-Boyd, Dulcie Holland, Eric Gross, Lawrence Bartlett, Colin Brumby, Philip Wilcher, Ian Shanahan, Robert Allworth. Duration: 71.35 This CD is named after Film Australia's award-winning documentary series on traditional crafts for which Strahan wrote the music, variations for 4 different ensembles on an original theme of Irish character. Among other appealing works featured are Carr-Boyd's "Foxtrot" for mandolins; Bartlett's piano piece "Jolly Octopus" (show-and-tell at Infant's School), and Robert Allworth's eerie outer space music for strings, "Zarcon 3", from a first performance in Japan at the Asian Composer's Forum '95. The CD also celebrates Derek Strahan's 60th birthday. Works by: Dulcie Holland, Eric Gross, Ann Carr-Boyd, Colin Brumby, Derek Strahan, Lawrence Bartlett, Robert Allworth. Duration: 69.26. The new Glebe Island Suspension Bridge in Sydney inspired pieces by Gross, Carr-Boyd and Allworth. The marine theme continues with "Fairy Penguins" (Holland) and "Fur Seals" (Bartlett). Instrumentation ranges from solo piano, quartet (Strahan's baroque "In The Attic") to "Fanfopus" by Gross, played by the Sydney Symphony Orchestra conducted by Patrick Thomas. Works by: Olive Anderson, Dulcie Holland, Colin Brumby, Ann Carr-Boyd, Larry Sitsky, Derek Strahan, Lawrence Bartlett, Robert Allworth, Eric Gross. Duration; 72.44 On the cover, the Sydney Opera House, a view showing the glass panels. Anderson's title piece reflects her love of the Australian landscape. Strahan's jazz-influenced film music "On The Reef" depicts the Great Barrier Reef. Jazz rhythms abound in the Rondo from Brumby's Clarinet Concerto. Sitsky's Sonata for Solo Mandolin is inspired by Hindu mythology. Holland and Allworth each contributes an elegy to a remembered friend. This CD contains a range of musical styles and offers an attractive overview of Australian music composition from 1964 to 1996. Works by: Dulcie Holland, Ann Carr-Boyd, Colin Brumby, Betty Beath, Lawrence Bartlett, Derek Strahan, Robert Allworth, Eric Gross. Duration: 69.08 On the cover, Archibald Fountain, Sydney. To this mellow collection, Holland contributes 4 pieces including Ballad for Clarinet & Piano, lovingly remastered from a 1955 recording featuring Clive Amadio & Olga Krasnik. There are diverse piano pieces by Carr-Boyd, Beath, Gross & Allworth. In lively contrast are Brumby's "Chiaroscuro" (1977) performed by Perihelion, and "Capriccio for Solo Bassoon", played by Ann Hoare. The CD concludes with Strahan's moody jazz-fusion piece "Free Spirit" (1982). An evocative piano piece by Holland provides the title track. From Carr-Boyd, the ever-popular "Fandango" for mandolins (1982) and the more recent "Murray River" (1995) written and played by the Sydney Guitar Orchestra. Strahan's "Piano Trio No. 1 in F" was commissioned to celebrate Australia Day in the Bicentennial Year (1988). It was first performed at a Champagne Breakfast, then again at Lunch, in Sydney's Centrepoint Tower overlooking the festivities in the Harbour. This 33-minute 4-movement work is in melodic, neo-classical style, and is a remastered recording of a live broadcast given during 2MBS Oz Music Week 1988. Read more about "Piano Trio No.1 in F"
Works by: Dulcie Holland, Robert Allworth, Colin Brumby, Lawrence Bartlett, Sven Libaek, Mike Irik, Richard Austin, Eric Gross, Derek Strahan, Ann Carr-Boyd, Olive Anderson. Duration: 68.05 Moody pieces for piano and small ensemble by Holland, Allworth & Carr-Boyd evoke summer, twilight, the moon - and Spain in "Habanera Serenade" by Gross. Lively contrast from Libaek's "3 Etudes" for piano, Irik's 1992 "Duet for 2 Bass Clarinets" and Strahan's "Aliens Among Us", music for a film documentary about insects. Brumby's "Victimae Paschali" for choir & Orchestra recalls Carl Orff's "Carmina Burana". Works by: Ann Carr-Boyd, Eric Gross, Robert Allworth, Dulcie Holland, Colin Brumby, Derek Strahan. Duration: 57.59. Five recent works for violin & piano open this attractive collection. They are by Carr-Boyd, Brumby (2), Allworth & Gross. The performers are Glenn Murray, violin, and Carr-Boyd, piano. With her daughter, Katrina, Anne also plays her lovely work "Songs Of Joy"(1996). Another composer/performer, Holland, plays her own "Piano Rag", and two "winter" pieces, one by herself and one by Allworth. Strahan's "On The Reef" Suite 2 presents more music written for Robert Raymond's documentary on the Great Barrier Reef. The CD concludes with the delightful "Rondino Pastorale" for mandolins, guitar & flute (1962) by Gross. Works by: Colin Brumby, Dulcie Holland, Eric Gross, Derek Strahan, Ann Carr-Boyd, Bruce Cale, Robert Allworth. Duration: 59.35. A wide variety of music. Big sounds from the Queensland Symphony Orchestra playing Brumby's "South Bank Overture"(1985); Holland's solo piano in the skittish "Three Dances for a New Doll"(1942); remastering of Allworth's "Cremorne Pastorale"(1970) for celesta, piano & string orchestra. ; the first CD release of Strahan's film music for Robert Raymond's 1968 film documentary on the Leyland Brothers' transit of Australia by 4-wheel drive in "Trans Australia Suite No. 1"; and Bruce Cale's intriguing "Cullenbenbong" for Bass Recorder & Temple Bells.